Last week, Howard Dresner released the 2014 Edition of his Wisdom of Crowds Business Intelligence Market Study. Mr. Dresner is Chief Research Officer of Dresner Advisory Services, LLC, an independent advisory firm and a well-known authority and author in the areas of Business Intelligence and Performance Management. Howard has 32 years of IT industry experience with 24 years in the Business Intelligence market. He spent 13 years at Gartner, where he was a Research Fellow and Lead Analyst for BI. He also served as Chief Strategy Officer at Hyperion Solutions prior to forming Dresner Advisory Services in 2007. Howard is a frequent speaker around the globe and has published two books on the subject – including: Profiles in Performance – Business Intelligence Journeys and the Roadmap for Change (John Wiley & Sons, November 2009) and The Performance Management Revolution: Business Results through Insight and Action (John Wiley & Sons, November 2007). Through the Wisdom of Crowds Business Intelligence market research reports, Howard engages with a global community to redefine how research is created and shared. 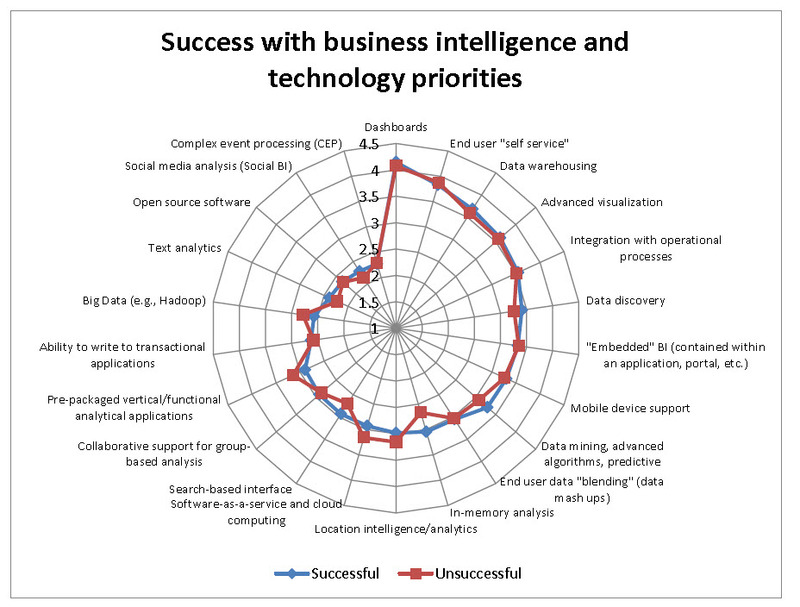 I thought I would share a peek into his report with you on the topic of Success with Business Intelligence and Technology Priorities. Mr. Dresner notes that with a few exceptions, reports of success with BI deviate little based on specific technology priorities. Those claiming success are slightly more likely to favor in-memory analysis and data mining and advanced algorithms. Those that are less successful were more likely to favor big data, analytical applications, software-as-a-service / cloud and location intelligence. As part of his survey, when asked for reasons why business intelligence fails, respondents point to shortfalls and constraints surrounding data that include “tools” and “time,” but also “business,” “organization” and “management”. Primary reasons for failure include: a lack of management understanding or appreciation of BI, a predominant focus upon technology vs. solving business problems and a lack of skills and resources to deliver solutions. To visualize the data associated with success and not being successful, Mr. Dresner uses a radar chart (see chart below). A radar chart is a graphical method of displaying multivariate data in the form of a two-dimensional chart of three or more quantitative variables represented on axes starting from the same point. The relative position and angle of the axes is typically uninformative. The radar chart is also known as web chart, spider chart, star chart, star plot, cobweb chart, irregular polygon, polar chart, or kiviat diagram. As I delve deeper into the report, I will share other insights with you. I had this error the other day. Fortunately, I had just been reading about working set governor settings the other night to prepare for the CPA and MCE exams. First, let’s discuss the issue. 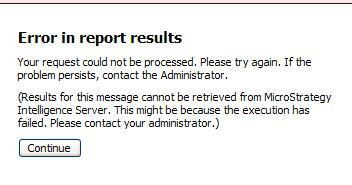 In MicroStrategy Web, when I executed a report, I received the following error message (also, see screenshot below). Basically, what happened was my report request could not be processed. Looking through the MicroStrategy KnowledgeBase, it basically tells you to try to run the report again. If it still throws this error, contact your Administrator. The MicroStrategy Intelligence Server was unable to swap out the report instances of 40MB in the Working Set. To resolve this issue, I needed to increase the size of Maximum RAM for Working Set cache to a higher value, for example 512,000KB. What is the ‘Working Set’ Governor Setting? When a user runs a report from MicroStrategy Web or Web Universal, the results from the report are added to what is called the working set for that user’s session and stored in memory on the Intelligence Server. The working set is a collection of messages that reference in-memory report instances. A message is added to the working set when a user executes a report or retrieves a message from his or her Inbox. Allow the efficient use of the web browser’s Back button. Improve web performance for manipulations. Allow users to manually add messages to the History List. The ‘Working Set file directory’ is the location in the filesystem where the Report Instances may be persisted on disk. A report instance will be persisted on disk in binary format if its size exceeds the limit set by the ‘Maximum RAM for Working Set cache’ governor or none of the report instances in memory can be swapped to make room for the new report instance. The persisted report instance will be persisted as the <filename(GUID)>.po and may be reused if the report is invoked again. The ‘Maximum RAM for Working Set cache’ is the governor that modulates the size of the WorkingSet Result Pool. The Maximum value is: 2147483647 MB, the Minimum value depends on version and is 200 MB in 9.3.1, and the Default value is: 200 MB. Note that if the value specified is greater then the machines memory it uses the default of 200 MB. The default value is usually sufficient, but if memory issues arise, as noted above, the setting can be increased. Increasing this setting means that the MicroStrategy Intelligence Server may be operating with a higher average memory footprint during its lifecycle, so proper tuning may be needed if memory usage becomes an issue. 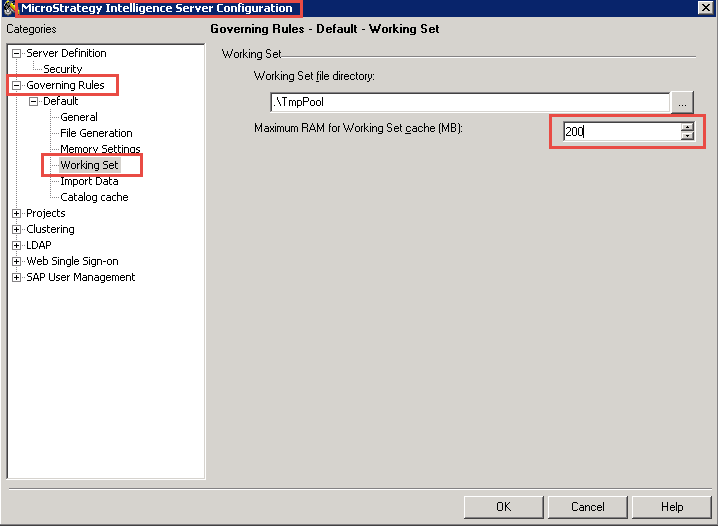 There is no Working Set (WS) for a session created by the MicroStrategy Desktop client. This is a MicroStrategy Intelligence Server configuration level setting, so it applies to all the projects and all the users and is not specific to a project. If these settings are changed, MicroStrategy Intelligence Server may need to be restarted. The MicroStrategy Working Set is not the same as the Microsoft Windows Operating System Working Set.